Are you looking for a new way to get your child into cleaning? Maybe a car wash toy could do the trick. What could be more fun than operating your own car service station? 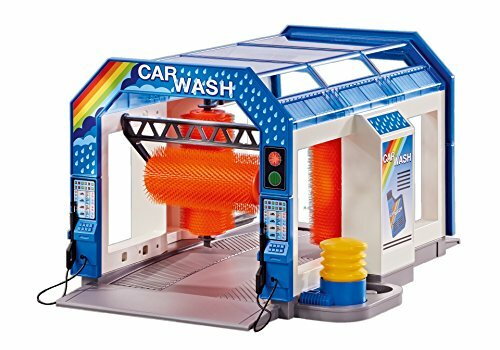 We’ve searched high and low to find the best car wash toys for children of all ages. Curious to know more? Make sure you stay tuned to see our top picks. Use the links above to check the latest prices or read our in-depth car wash toy reviews below. 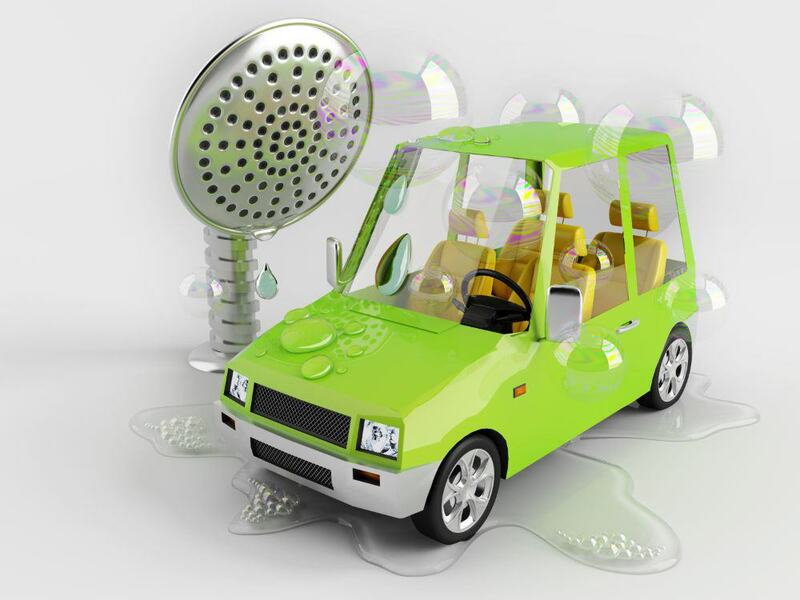 Before you go out to buy a car wash toy for your child, there are a few things to look for. You want to make sure you get the best toy set that’s safe, fun and can last as long as possible. Most car wash toys are made of plastic. But, there are a few toys on the market that are actually made of wood. For younger toddlers and babies, a wooden car wash toy may be best as these usually have bigger, more durable parts. If your child wants to use water to make the car wash come to life, plastic is the way to go. Wood or wood-like material will most likely become damaged when exposed to water. That said, always make sure the product is made with non-toxic materials. Choose something that doesn’t contain any chemicals such as phthalates or lead, for example (source). Babies: For the youngest family member, look for playsets that aren’t too overwhelming in terms of design. Additionally, it has to be safe, durable and not contain any small or loose parts (source). Toddlers: Try to find something that’s open-ended and encourages pretend play — maybe some features such as lights and sounds. It should be sturdy since toddlers can play rough sometimes (source). Older children: Bigger children might prefer something that’s more close to reality. They’ll probably also like a few action features, such as working parts and color-changing cars. There’s a range of car wash toys available on the market. Some resemble a gas station with an added car wash. Others are bigger and include a race track. Again, it’s important to consider your child’s age. For instance, a young toddler might make a huge mess when playing with water. It might be a better option to choose something simple where they get to use their imagination. The bigger toys often require a bit of assembly, so you might need to help out. For older children, there are car wash toys with added effects that younger kids may not be able to use, or won’t appreciate. For budding car enthusiasts, having a car wash might be the perfect addition to an amazing collection of toys. And hopefully, our quick guide will help you to find the best car wash toy for your child. Keep reading to see our top picks. This wooden service station is a great place for the imagination to go wild. 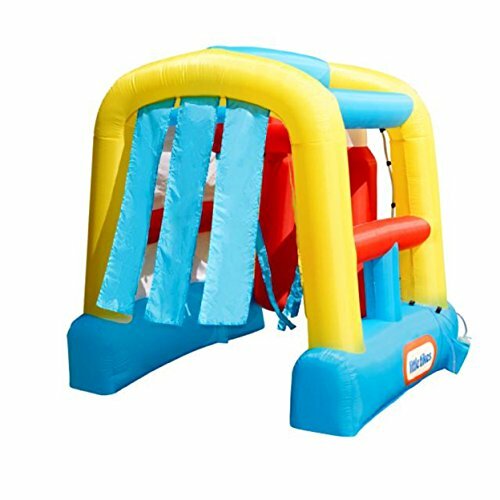 It features two levels for your child to navigate their favorite car through. On the ground level, there’s a drive-through car wash. On the side, there’s a gas pump, and on the top level, a parking lot. Your child will also get two cars to play with. Suitable for ages 3 to 6 years. 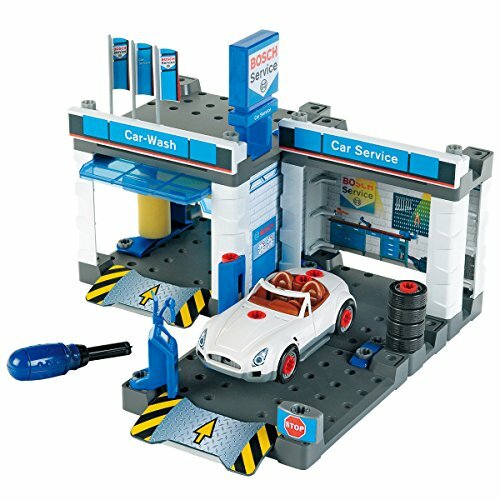 If your child enjoys building and assembling, this car wash set could be a top runner. Once assembled, the Lego playset resembles a garage. A car wash, as well as a gas pump, are on the bottom level. There’s also a repair station. On the second level, you’ll find a parking area with a working elevator to transport the cars. 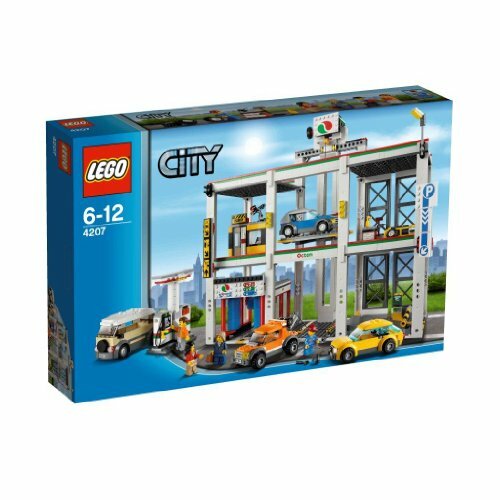 The set includes five Lego figures and three cars. Recommended for children from 6 to 12 years old. 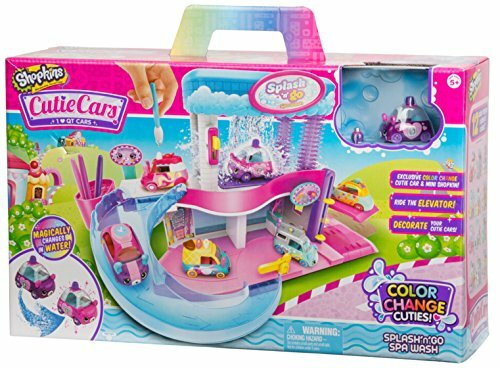 The Spa Wash set has two levels that the Cutie Cars have to drive through to get clean. There’s also an elevator, decoration station, and a dry and scent station. Fill the container at the top with icy water, and the cars will change color as they are exposed to it. After the wash, your child can take the car to the decoration station. Here, they use the special brush to decorate the car as they like. For ages 5 and over. On this track, your child has to get their car through the wash as quickly as possible. Just after the wash, there’s an alligator waiting, hungry for automobiles. 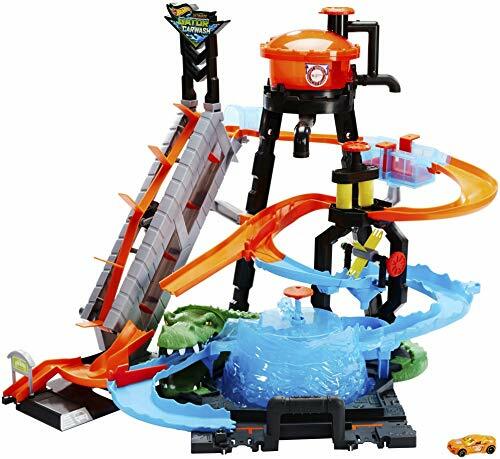 This toy set from Hot Wheels also features an elevator that will take the cars to the starting line. Your little car enthusiast will also get one color-changing car. The car changes color as it is exposed to water. Ages 4 and up. This four-level garage features a spiral-like ramp that the cars have to drive down to get to the different levels. The top level is where the cars enter through the working elevator. Next, they drive down the ramp into the car wash followed by a repair station. At the bottom, you’ll find the gas pump to fill up the cars before playing. The set includes a tow truck. Recommended age range 3 to 10 years. When inflated, this car wash from Little Tikes stands over 5 feet tall. Your child can engage in some great outdoor summer fun with siblings and friends. There are lots of great features to help the kids stay active, and on the inside, you’ll find two spray heads. 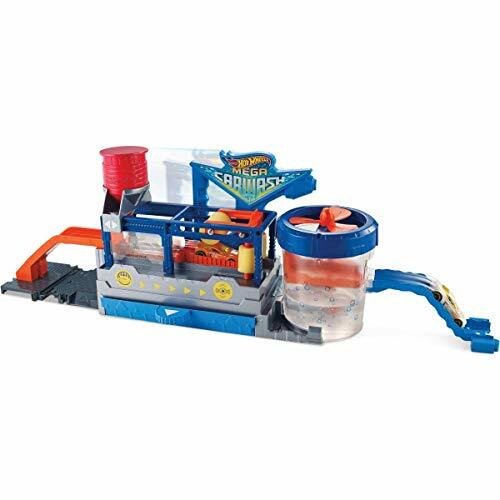 There’s also a bubble maker and a blower. You’ll get everything you need in this set, and the best thing is that it’s quick to inflate. Let your children use their imaginations, maybe even invite some friends over and let them bring their cars. For ages 18 months to 8 years. 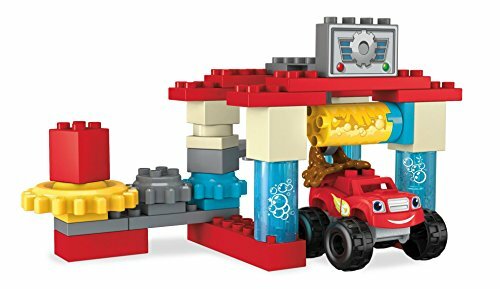 This playset looks like a regular drive-through car wash. It features two large brushes, a horizontal and a vertical, similar to the real thing. There’s also a pump which your child has to press to get the water started. This car wash toy is part of a series. Your child can easily play with it separately, but it’s also great fun to play with the whole collection. For ages 4 and over. The playset includes a tow truck, but it’s not like any other truck. This one will actually respond to specific points around the garage. When placed correctly, it will respond with sounds and phrases. It might also sing a little tune, which could be a song your child already knows. The garage also features an elevator, a repair station, helipad, gas pump, and of course an awesome car wash. Suitable for ages 1 to 5 years. With this playset, your child gets to become a mechanic. The set comes with a white convertible car and a screwdriver. There are different points in the set to unscrew and then repair again. This is a great way for children to develop their fine motor skills and problem-solving further. And when your child feels it’s time for a wash, they can drive the car into the car wash. For children aged 3 to 8 years. 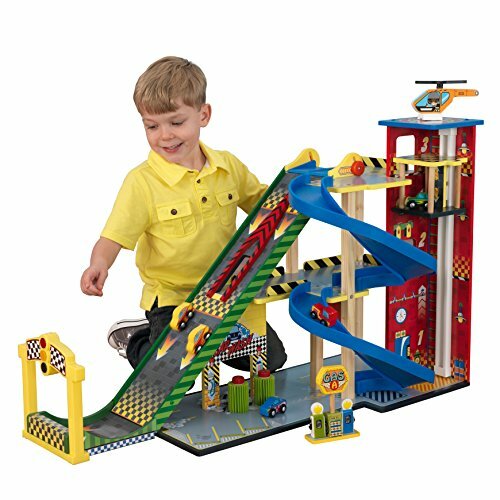 This mega ramp from KidKraft has lots of fun features for kids to explore. It has a countdown sign with red, yellow, and green lights. By learning what the different colors mean, they get an excellent opportunity to learn about road safety. As well as the mega ramp, there’s a gliding elevator, helipad, a spiral ramp, gas pump, and a car wash. The wash consists of two sponges that spin as the cars drive through, just like the real deal. The set includes two cars and a helicopter. For ages 3-15 years. Toddlers are always testing out stuff to see the reaction. This car wash allows them to explore just a little more. Drive the dirty monster truck into the car wash and watch what happens as your child turns the red block. The whole wash is set up with three gears that your kiddo controls. As they turn, the truck will be cleaned. Recommended for ages 3 to 6 years. 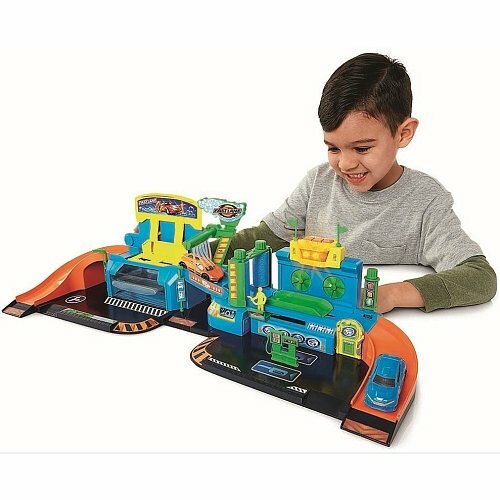 Watch as the cars change color through the different stages of this car wash toy from Hot Wheels. The first part of the wash is filled with warm water; as it’s squeezed onto the car, the car’s color will change before your eyes. Then the dunk tank is filled with cold water. Once the car is submerged, it will change back to its original color. Complete with an automatic conveyor belt, the spill-proof design will be appreciated by moms and dads. For ages 4 and older. Incorporating a car wash, this utility truck will lift the car and dump it into the dunk tank. Here, the cars will get a nice scrub down. Once done, lift the orange lever and let the car ride down the ramp. The set includes a mud pit to get the fun started. Fill it with cold water to change the color of the car, which is included in the set. 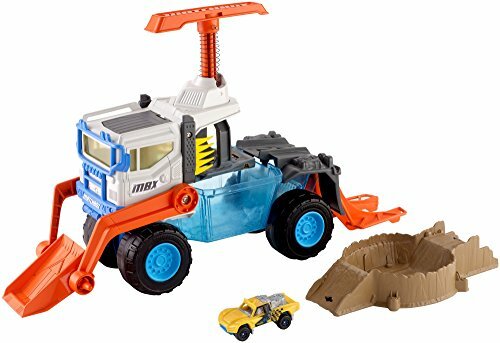 This toy lets your youngsters practice their helping skills by using the truck to save the car from the pit. For kids aged 3 to 7 years. 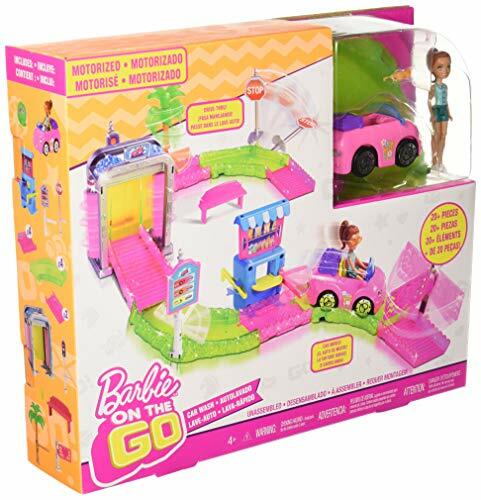 Drive the mini Barbie and her car through the colorful car wash. 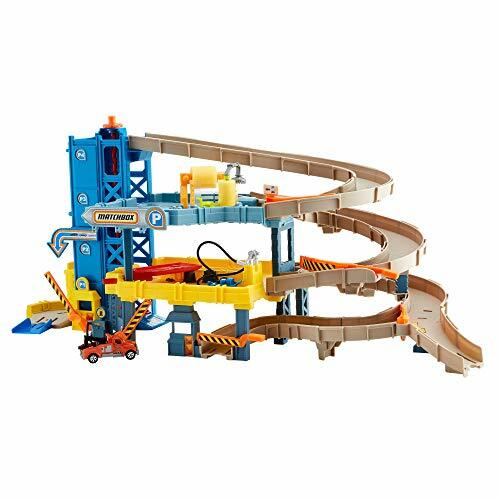 The track consists of eight parts which your daughter can assemble into various scenarios. The different accessories, such as the traffic lights, will be activated as Barbie drives by. To start the car, simply press the license plate button. It will activate the car and the fun will begin. For ages 4 to 8 years. 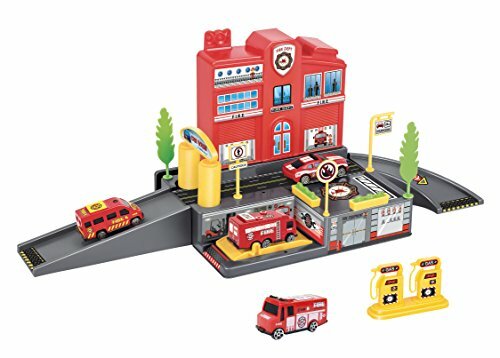 With this car wash playset, your little one can practice some fine motor skills while learning about the civic duty of firemen. Included is a gas station, car wash, roadway, and garage lift. You’ll also receive accessories including stickers, decorative trees, traffic signs, and four rescue vehicles. This is a great set to encourage community learning. For ages 3 and over. 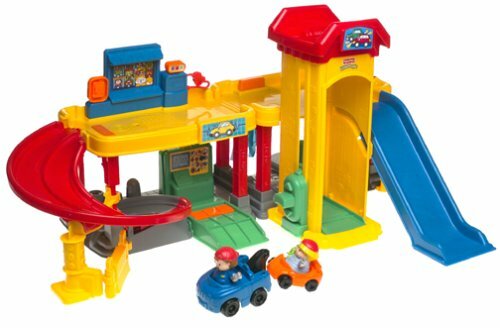 The Little People garage features two ramps, an elevator, parking area, gas pump, and car wash. It even has a mini-mart and a tire store. They didn’t leave out the diagnostic center, either. Teach your children about car maintenance with this one. As your child explores the garage, they can discover seven sounds. 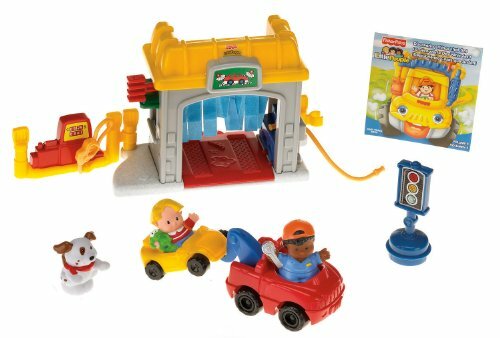 The playset includes a tow truck, a car, two connectable fences, and two characters. Recommended for age 2–5 years. In this car wash from Fast Lane, the cars go in on one side and are then dumped in the water tank. After a few seconds, the car is shot out of the water and then has to go through two turning sponges. When the car is squeaky clean, it’s time to race to the finish line. 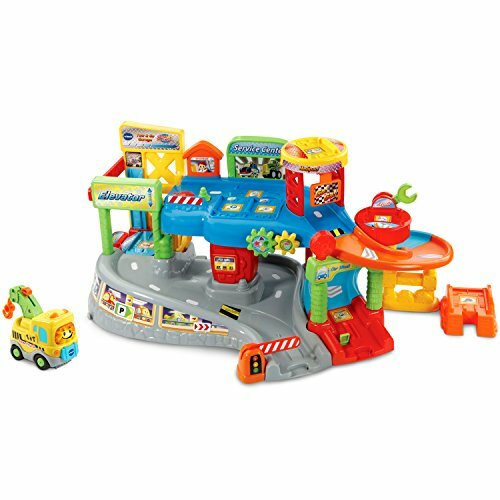 The set includes three color-changing cars, and there are a few lights and sound effects to keep the fun going. Ages 3 and up. 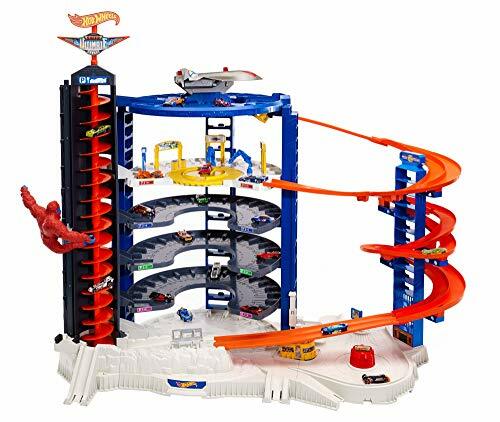 Let your child engage in hours of imaginary play with this 3-foot tall car garage from Hot Wheels. It features a spiral elevator that the car has to get through without disturbing the gorilla. Drive down the first ramp to enter the repair station, where you’ll find the car wash. The whole garage set can transport 23 cars at a time. It can also hold more than 140 cars for easy storage. For ages 5–9 years. No doubt Fisher-Price is a leading brand. Watch as your little one turns the crank to get the car wash moving. The ramp will even go up and down as your child becomes a super mechanic. The set includes two characters, a dog, tow truck, and a traffic light. Suitable for kids from age 12 months. The best car wash toys can be so much fun. They’re a great way for children to explore their imagination as they find new ways to clean their favorite cars. Whether you choose a realistic-looking car wash or an imaginary one, your child is sure to love it. 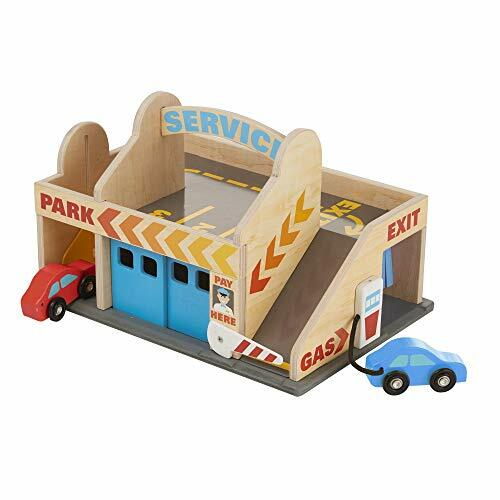 Our favorite has to be the Melissa and Doug service station, it is made out of wood, has an attractive design and comes from a well-known and trusted brand. Remember to consider the size of the different parts, especially if your child is still very young. Also, keep in mind the complexity of the playset, and that you may need to help your child get started. Does your child enjoy going to an actual car wash? Is your kiddo into cars? Share a few comments down below.